Orange Creamsicke Bars | Rosetta Bakes! If you love lemon bars, and you love oranges, you should love this recipe. It has the same type crust on the bottom that lemon squares have. This recipe was on a notebook card inside a Hallmark recipe notebook. I was about to toss it away when the word “creamsicle” jumped out at me and told me I had to make this recipe. I was not disappointed nor were my co-workers! 2. Make the crust: In a large bowl, with an electric mixer, blend together the flour, confectioners’ sugar, butter and orange zest until crumbly. With lightly floured hands, press the mixture evenly into the bottom of an ungreased 9 x 13-inch pan. Bake for 20 to 25 minutes or until golden brown. 3. Meanwhile make the topping: In a large bowl, lightly beat the eggs. Mix the granulated sugar, flour, baking powder, orange juice and sour cream. Set aside until the crust is done. 4. Remove the crust from the oven, quickly remix the orange toping and pour it over the warm crust. Return to the oven and bake for 25 to 30 minutes or until the top is a light golden brown. Let cool. Just before serving, sprinkle the top with confectioners’ sugar through a strainer. 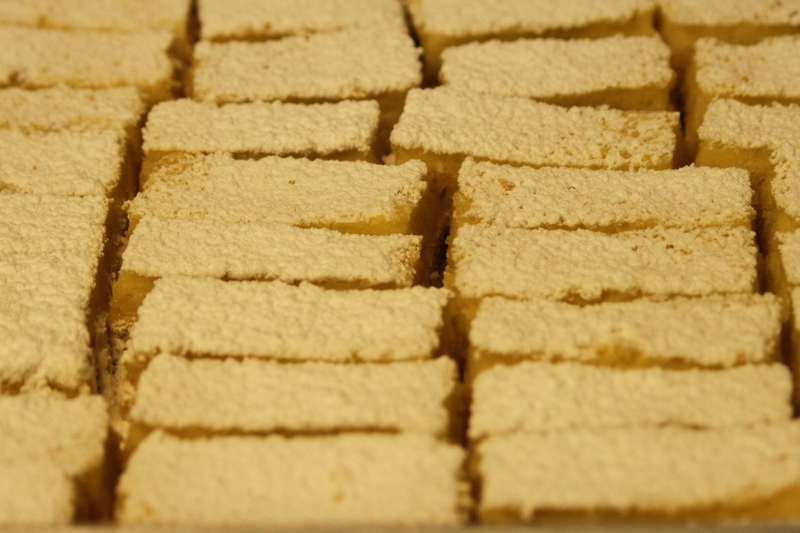 Cut into 36 bars; 1-1/2 inches by 2 inches.